In Assyrian and Babylonian mythology, Pazuzu (Sometimes Fazuzu or Pazuza) was the king of the demons of the wind, and son of the god Hanbi. He also represented the southwestern wind, the bearer of storms and drought. 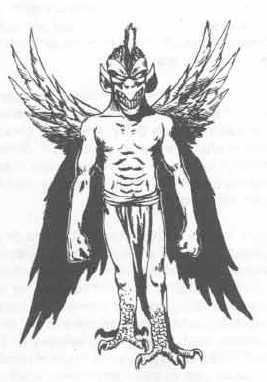 Pazuzu is the demon of the southwest wind known for bringing famine during dry seasons, and locusts during rainy seasons. Recent research suggests Pazuzu may have been associated with a cold, northeasterly wind. Pazuzu was said to be invoked in amulets which combat the powers of his wife, the malicious goddess Lamashtu, who was believed to cause harm to mother and child during childbirth. Although Pazuzu is, himself, an evil spirit, he drives away other evil spirits, thus protecting humans against plagues and misfortunes.